Champion Hip 47. Photo by The Racing Biz. Perennial yearling show participant Robert T. Manfuso took home the Chanceland Farm Challenge Trophy for grand champion when his Fed Biz colt out of the Elusive Quality mare Proficient was picked by judge Rick Violette at the 84th annual Maryland Horse Breeders Association’s Maryland-bred yearling show, held on Sunday, June 24 at the Timonium Fairgrounds horse show ring in Timonium, Md. Violette selected as his reserve champion a Bandbox filly out of Dearie Be Good (by Scrimshaw) bred and owned by Ellen Charles’ Hillwood Stables and the winner of Class III. Charles had campaigned Bandbox, who now stands at Northview Stallion Station in Chesapeake City and whose first foals are current 2-year-olds. 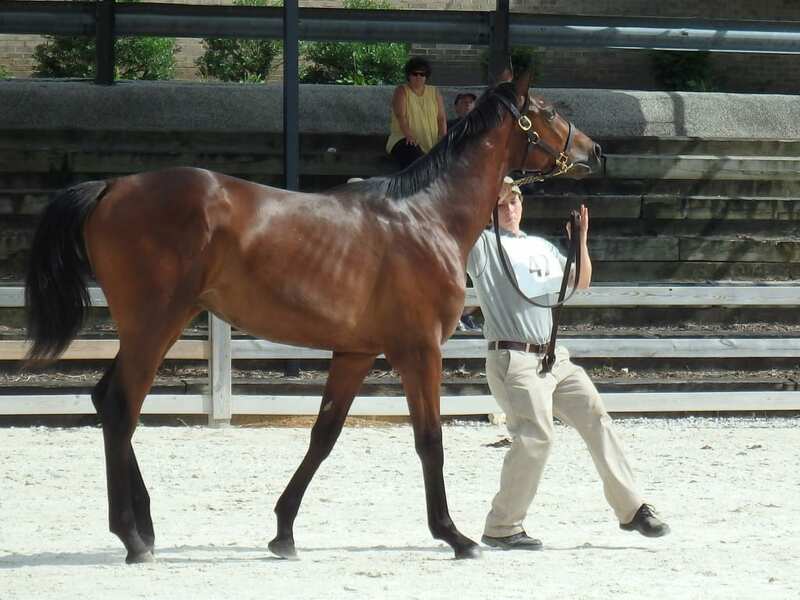 The leading Maryland stallion of the show was Northview Stallion Station’s first-year sire Golden Lad, a son of Medaglia d’Oro who had three class placements from 11 shown. He appropriately took home the Northview Stallion Station Challenge Trophy. Owned by a syndicate, Golden Lad sired the second and fifth-place finishers in Class I and the second-place finisher in Class III. All yearlings who entered the show ring are now eligible for the $40,000 premium award, which will be split and distributed twice, with $20,000 going to the exhibitors of the four show contestants who earn the most money as 2-year-olds during 2019, and another $20,000 divided among the exhibitors of the four highest-earning 3-year-old runners the next year. 1. b.c., 3/29/17, Bourbon Courage—Uncanny Nikol, by Outflanker. Owned and bred by Lady Olivia at North Cliff LLC, Rixeyville, Va.; 2. dk.b./br.c., 2/3/17, Golden Lad—Belterra, by Unbridled. Owned and bred by Robert T. Manfuso, West Friendship, Md. ; 3. dk.b./br.c., 2/12/17, Imagining—Night Brigade, by Rockport Harbor. Owned and bred by Finn’s Nickel LLC and Anchor and Hope Farm Inc., Port Deposit, Md. ; 4. JOHNG, b.c., 2/12/17, Baltimore Bob—Ferry Music, by Wiseman’s Ferry. Owned and bred by Alberts Racing LLC, Laurel, Md. ; 5. b.c., 2/14/17, Golden Lad—Grand Canyon Gold, by Tale of the Cat. Owned by Donald Barr and Walter Vieser, New Market, Md. Bred by Kevin P. Morgan. 1. b.c., 3/27/17, Fed Biz—Proficient, by Elusive Quality. Owned and bred by Robert T. Manfuso, West Friendship, Md. ; 2. dk.b./br.c., 2/16/17, Street Sense—Get Set Go, by More Than Ready. Owned and bred by Robert T. Manfuso, West Friendship, Md. ; 3. dk.b./br.c., 2/5/17, Mr Speaker—Tizabird, by Tiznow. Owned and bred by Robert T. Manfuso and Katharine M. Voss, West Friendship, Md. ; 4. ch.c., 4/13/17, Tapizar—Plum, by Pure Prize. Owned and bred by Dark Hollow Farm, Upperco, Md. ; 5. dk.b./br.c., 2/13/17, Honor Code—Joy, by Pure Prize. Owned and bred by Dark Hollow Farm, Upperco, Md. 1. BE GOOD, gr./ro.f., 2/12/17, Bandbox—Dearie Be Good, by Scrimshaw. Owned and bred by Hillwood Stables LLC, Washington, D.C.; 2. dk.b./br.f., 5/13/17, Golden Lad—Hello Now, by Tiznow. Owned and bred by Hillwood Stables LLC, Washington, D.C.; 3. dk.b./br.f., 4/16/17, Great Notion—Long Time Gone, by Pioneering.Owned and bred by Gelli Partners LLC and Michael J. Harrison DVM, Bel Air, Md. ; 4. FREEDOM BLAYZE, b.f., 3/14/17, Freedom Child—Hurricane Isabella, by Prospect Bay. Owned by George Busche and Linda Walls, Georgetown, Tex. Bred by LGB Thoroughbreds; 5. ch.f., 2/11/17, Etched—Bay of Bengal, by Rakeen. Owned and bred by Bonita Farm, Darlington, Md. 1. dk.b./br.f., 2/26/17, Tapizar—Over the Moon, by Malibu Moon. Owned and bred by Dark Hollow Farm, Upperco, Md. ; 2. b.f., 2/4/17, Ghostzapper—Naive Enough, by Street Sense. 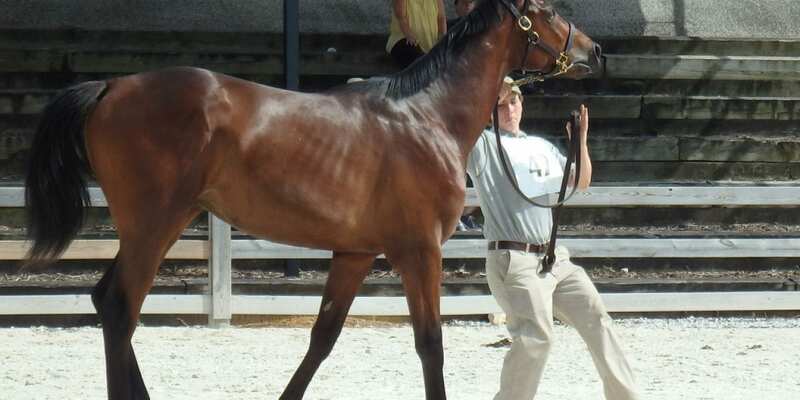 Owned and bred by Sagamore Farm, Reisterstown, Md. ; 3. SELF ASSURED, dk.b./br.f., 2/3/17, Tale of the Cat—Bridled Assurance, by Unbridled’s Song. Owned and bred by Hillwood Stables LLC, Washington, D.C.; 4. dk.b./br.f., 4/21/17, Congrats—Starsonhershoulder, by Quiet American. Owned and bred by Dark Hollow Farm and Mr. and Mrs. Arnold Davidov, Upperco, Md. ; 5. b.f., 1/27/17, Uncle Mo—Luna Time, by Malibu Moon. Owned and bred by Dorsey Brown and Richard Palmer, Butler, Md.